The Sweet Inspirations were an American R&B girl group founded by Emily "Cissy" Houston (née Drinkard), mother of Whitney Houston, and sister of Lee Warwick (herself the mother of well-known sisters Dee Dee and Dionne Warwick). Houston and Warwick were members of The Drinkard Singers, a family group that had the distinction of recording the first Gospel album to appear on a major label—a live recording from The Newport Jazz Festival in 1959. The line-up included Judy Guions (who later became Judy Clay), Marie Epps, Larry Drinkard, Nicholas Drinkard, Ann Moss, Lee and Emily. The original backup group, that was so in demand among producers, publishers, artists, and songwriters in the early 1960s, included Doris Troy and the two Warwick sisters. Both Troy and Dionne Warwick enjoyed solo careers with hits in 1963, "Just One Look" and "Don’t Make Me Over" respectively, on which the Sweet Inspirations can be heard. At that time, Sylvia Shemwell (sister of Judy Clay) replaced Troy, while Cissy Houston took over from Dionne, with Dee Dee Warwick as the group’s official leader. The group sang backup for many stars, including Solomon Burke, Aretha Franklin, Wilson Pickett, and Esther Phillips. Dee Dee left in 1965, when her solo career began to take off. She was replaced by Myrna Smith. Estelle Brown joined the team soon after, and the line-up that was to become an Atlantic recording group was set. In a recording session on March 28, 1967, the Sweet Inspirations provided the back up vocals for Van Morrison on his classic hit "Brown Eyed Girl". It was released in June 1967 and rose to No. 10 on the Billboard Hot 100 charts. In October 2007, Morrison was awarded a Million-Air certificate by BMI for 8 million air plays of "Brown Eyed Girl". The Sweet Inspirations recorded by themselves for the first time in April 1967 for Atlantic Records. That session produced the first two singles released by Atlantic, a version of "Why (Am I Treated So Bad)," a song previously recorded by The Staple Singers and a soulful version of "Let It Be Me", a French song which had been a pop and R&B hit for Betty Everett & Jerry Butler in 1964. Though their first singles lacked much chart success, Atlantic was committed to the group, and an August session in Memphis yielded the bulk of songs used for the group’s self-titled debut album, released in the late fall of 1967. Within a month of their chart climb, the group began work on their second album - a gospel record entitled Songs Of Faith & Inspiration. It was released in 1968 under the name "Cissy Drinkard & The Sweet Inspirations." On March 30, 1968, the group scored their first and only top forty hit on the Billboard Top 40 Pop Chart with the song "Sweet Inspiration" on Atlantic Records. The record was on the chart for ten weeks and peaked at number 18. The group at this point was composed of Houston, Brown, Shemwell, and Smith. In 1967, the group did backing vocals for the Jimi Hendrix single "Burning of the Midnight Lamp" which was later featured on the album Electric Ladyland in 1968. [citation needed] They also backed Dusty Springfield on her album Dusty in Memphis. Shortly after cutting the gospel set, the Sweet Inspirations were back in Atlantic’s studios to record their third album, What the World Needs Now is Love, recorded in February 1968 in Muscle Shoals, Alabama with the Muscle Shoals Rhythm Section, who had played on hit recordings by a number of acts including Aretha Franklin, Percy Sledge, and Clarence Carter. The late April session yielded a version of The Bee Gees’ "To Love Somebody", which became the group’s fourth R&B chart hit, and a version of The Righteous Brothers' "Unchained Melody," which gave the group a charted, though minor hit. In 1969, the group recorded their fourth album, Sweets for my Sweet. The Sweet Inspirations also began recording and touring with Elvis Presley as both background singers and his warm-up act, as well as doing occasional live dates with Aretha Franklin. The association with Presley became well-publicized as he routinely introduced the Sweet Inspirations (along with the TCB Band members, the J. D. Sumner & Stamps Quartet, and Kathy Westmoreland) on his telecast concerts and live recordings. 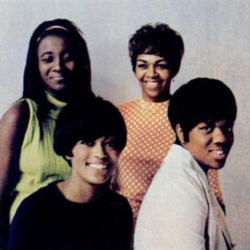 Houston's last recording session with The Sweet Inspirations was in October 1969, since she wanted to pursue a solo career and concentrate on her family. The session produced the group’s biggest R&B hit in some time. A Gamble & Huff composition, "Gotta Find Me A Brand New Lover" appeared on the group’s fifth album Sweet Sweet Soul. The remainder of the album was recorded in November 1970, with Shemwell, Brown, Smith, and new member Ann Williams, a friend of Brown's who stayed for what turned out to be the group’s last full Atlantic album. Also included from that set are "That’s The Way My Baby Is", and "Flash In The Pan". Moss disappeared during a tour with Elvis Presley and did not return to the group. A final Atlantic session in June 1970 brought the group (now a trio with Brown, Smith, and Shemwell) its last two singles for the label; "This World" (from the musical The Me Nobody Knows), and "Evidence". In 1973, Brown, Smith, and Shemwell recorded an album for Stax Records. By 1979, Estelle Brown had quit the group and was replaced by Gloria Brown, who toured with them but didn’t sing on the Sweet Inspirations’ last LP, Hot Butterfly, on RSO Records, with singer Pat Terry featured on the actual recording. They group broke up shortly thereafter. In 1978, the group sang backing vocals on Frankie Valli's No.1 hit "Grease" from the film of the same name. In 1979, the group toured with The Bee Gees during their U.S. Spirits Having Flown Tour singing backup. The Sweet Inspirations (Estelle Brown, Smith, and Shemwell) got back together again in 1994, with new member Portia Griffin. They performed at Elvis Presley tribute shows and released new material in 2005. Shemwell suffered a stroke in 2001 that has kept her from performing with the group. They also recorded choir backing for The Killers' 2004 recording, Hot Fuss, on songs "Andy, You're a Star" and "All These Things That I've Done". Shemwell died on February 13, 2010. In March 2010, while on a European tour for Elvis: The Concert, Smith developed pneumonia. Once back in the U.S., her condition continued to deteriorate, as she suffered kidney failure, further complicated by a severe stroke. By October 2010, she was a patient at the Canyon Oaks Nursing & Rehabilitation Center in Canoga Park, California. She died on December 24, 2010. Smith was replaced with Los Angeles-based singer Kelly Jones; as of March 2011[update], the Sweet Inspirations are continuing to perform backup vocals with Elvis: The Concert and continue to do many concerts worldwide with Elvis Presley Enterprises' first ever "Ultimate Elvis Tribute Artist", Shawn Klush, sometimes as a duo and other times as a trio. ^ "Peter Gabriel Receives Top Honor at BMI London Awards". bmi.com. 16 October 2007. Retrieved 4 April 2018. ^ Atlantic Records 2476; Joel Whitburn, The Billboard Book of Top 40 Hits, p. 449 (Revised and Enlarged 5th ed. 1992). ^ "Myrna Smith - Interview - Elvis Information Network". www.elvisinfonet.com. Retrieved 4 April 2018. ^ "Shawn Klush Elvis Tribute Artist". www.shawnklush.com. Retrieved 4 April 2018.